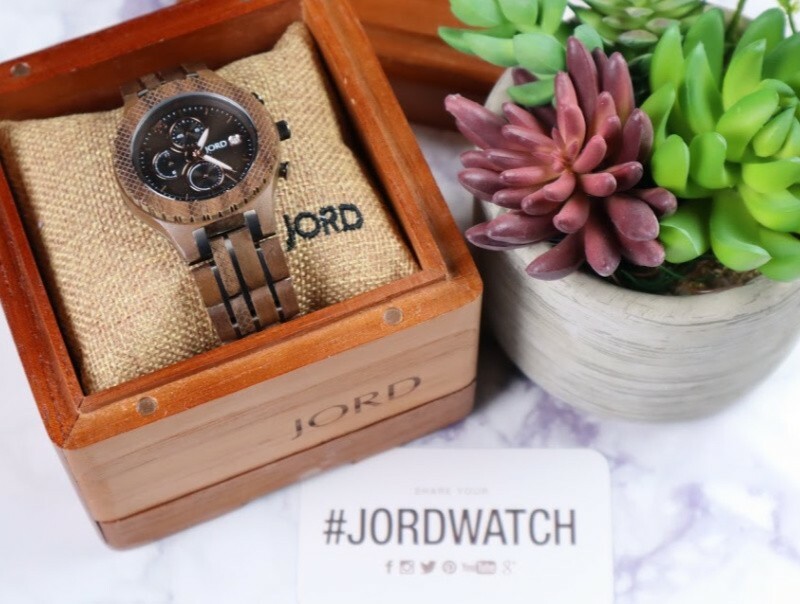 I am super excited to talk all things JORD Wood Watches with you all after receiving a gorgeous watch to review for my husband. I chose the JORD Walnut & Jet Black Conway Wood Watch as I knew that my husband would love the gorgeous chronograph functionality. With this gorgeous watch from JORD, my husband can master his time beautifully. 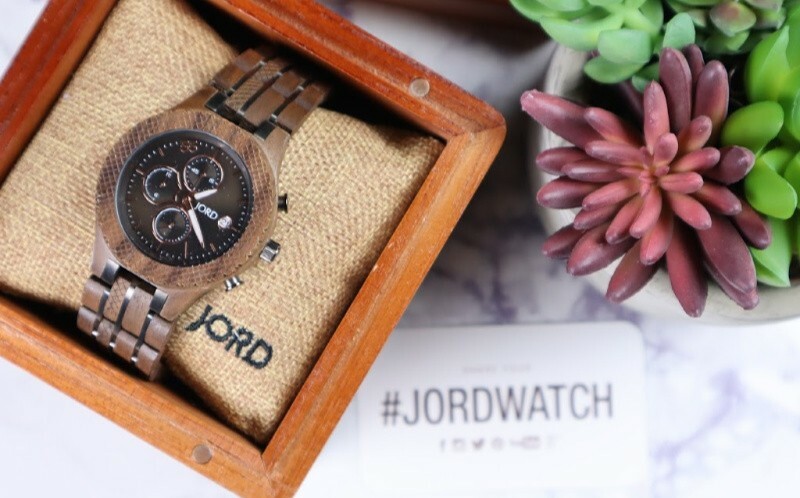 First I have to stress about the fact that JORD Wood Watches come beautifully packaged which makes them the perfect gift idea for anyone in your life as they carry gorgeous watches for both men and women and they have a gorgeous assortment of styles to suit anyone’s tastes and style. 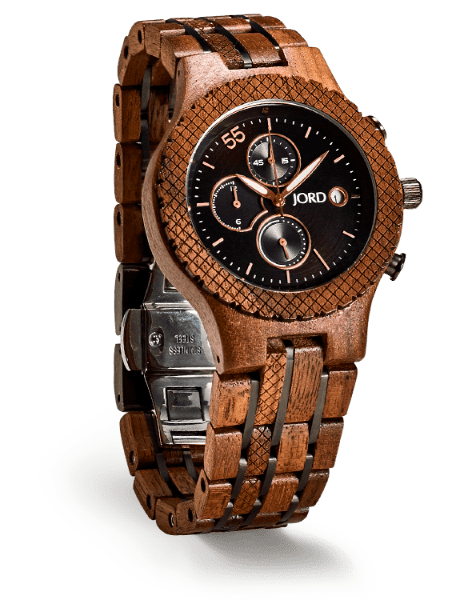 The JORD Walnut & Jet Black Conway Wood Watch is no exception and this gorgeous style comes in different wood color combinations as well so there for sure is the perfect style for you. As you can see.. the JORD Walnut & Jet Black Conway Wood Watch is stunning. The gorgeous chronograph functionality allows you to take on anything that your day throws your way. This is classic design that meets modern detailing with custom knurling on both the bezel and wrist line and the new band design features complimentary wood and stainless steel links which are striking. The beautiful combination of walnut and the pop of black jet make this piece perfect for dressing up and dressing down. It is quite honestly perfection and my husband is loving it. As you can see the Conway JORD Wood Watch comes in several color options and I also have to point out that JORD takes care of you as this gorgeous piece came with a complimentary $115 care package free of charge! That is right… this package includes a collector’s edition humidor cedar watch box as well as a cleaning cloth and 6 month supply of JORD Preserve which is a custom-formulated wood treatment gel with applicator pen. This is a fabulous presentation piece and a great way to keep your watch stored when not in use as it will keep your timepiece in tip top condition for years to come. So what do you think of this gorgeous timepiece from JORD Wood Watches? You have to make sure to stop by and checkout their website as they have a gorgeous collection of watches for both men and women and you can even customize them with personalized engraving and sizing. If you are interested in a wood watch then JORD is the place to go! Check them out online and visit them on social media as well PLUS enter below for a chance to win a discount code for $100! 1 Lucky Winner Will Receive A $100 Discount Code Good Towards Any JORD Wood Watch! Love these wooden watches. Not sure how they would hold up in the water, but I still want one. I would probably go with the fieldcrest, one is because its beautiful! second its more in my price range and its for women. I would love to use the credit toward the Cora Polaris in turquoise. I have been eyeing that watch since I first saw it. I haven’t had a watch in years and would enjoy having it for my use. But even though I know they are excellent watches I would probably have to get the Fieldcrest. I like the Cassia walnut & vintage rose watch. I like the thinner band. I would get a women’s watch. I like the size and color of the Cassia walnut & vintage rose. The Jord Meridian Nightfall because it looks like something my husband would like. I like the Cora Polaris Koa & Rose Gold watch! It’s beautiful! I would get the Women’s watch, CORA POLARIS in zebrawood & turquoise because it’s absolutely gorgeous! Love it! What a beautiful watch – I’ve never seen a wooden strap before but I love it! That is a very pretty use of walnut. This is an heirloom piece for sure; so gorgeous! My friend has been wanting one of these for a while. I’ll let her know about this giveaway so she can enter.